"How on earth are you ever going to explain in terms of chemistry and physics so important a biological phenomenon as first love?" Dedicated to all those who are in love. I remember my first love at the age of 9 in primary school. Classmates nicknamed him "Soy Sauce" in Chinese, but 20 years later I ended up marrying someone (namely Viking Man) quite far from "Soy Sauce", although I must say he likes soy sauce very much. 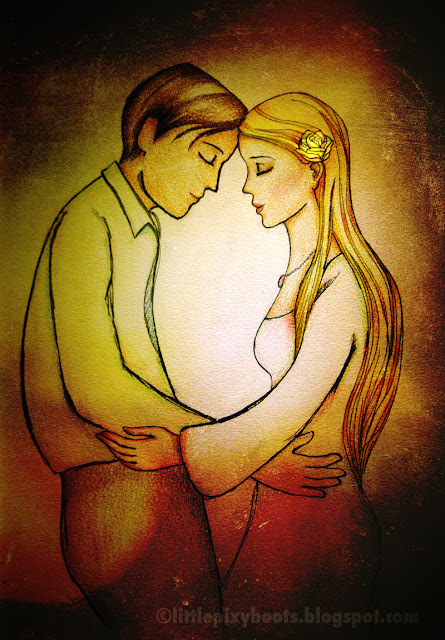 In this illustration, I hope to capture the pure white feeling of love - whether it is the first or the last. Even as a bride I remembered that the feeling of love I've got for my man is very much like my first love - joyful, uncontaminated, blissful. The world revolves around only you and your lover. Illustrated on Canson watercolour paper with pencil, ink and coloured pencils. Background effects added in Adobe Photoshop. This is a very fresh illustration!